The Fourteenth Census of the United States (1920) found the Lowrys living in Leetonia, Ohio. The previous seventy years took the Lowry family from Westmeath, Ireland to Huntingdon, Pennsylvania to Salem and then Leetonia, Ohio. After 1920, we would further find ourselves in Youngstown and then spread across the United States to major metropolitans like Houston, New York and Washington. But in 1920, we are in Leetonia with four generations under one roof starting with 80-year old Michael Lowry Sr. down to his great grandchild, the 1-year old Joseph McSweeney. 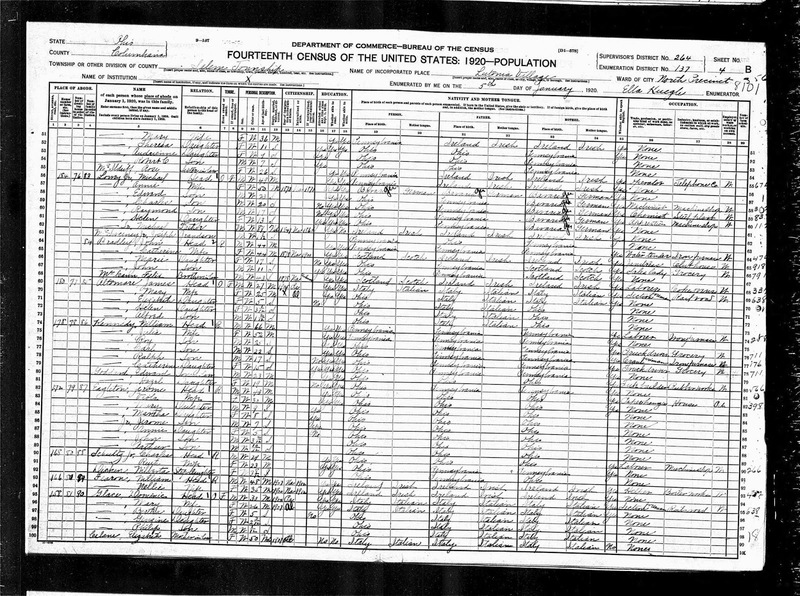 “United States Census, 1920,” index and images, FamilySearch (https://familysearch.org/pal:/MM9.1.1/MDLY-931 : accessed 26 Dec 2012), Michael Lowry in household of Michael Lowry, Columbiana, Ohio; citing enumeration district (ED) 137, sheet 4B, family 83, NARA microfilm publication T625, FHL microfilm 1821356.